LUCY BURDETTE: When I heard that Alexandra Sokolof had a new writing workbook out, I asked her to come talk about it. She is very very good at explaining why a story works and what we fiction writers can learn from Hollywood. Welcome Alex! ALEXANDRA SOKOLOF: Always a pleasure to be here! I was a screenwriter for ten years before I wrote my first novel, and now in between being a full-time mystery novelist, I teach my Screenwriting Tricks for Authors workshop all over the US and internationally (last week as a master class for the Bloody Scotland Crime Festival) as well as to film students in Los Angeles. But the real secret of film writing and filmmaking, that I teach authors to steal for their novel writing, is that most movies are written in a Three-Act, Eight-Sequence structure. Yes, most movies can be broken up into eight discrete 12-15-minute sequences, each of which has a beginning, middle and end. The eight-sequence structure evolved from the early days of film when movies were divided into reels (physical film reels), each holding about ten to fifteen minutes of film (movies were also shorter, proportionately). The projectionist had to manually change each reel as it finished. Early screenwriters (who by the way, were mostly playwrights, well-schooled in the three-act structure) incorporated this rhythm into their writing, developing individual sequences that lasted exactly the length of a reel, so that as the reel ended, the sequence also ended, on a cliffhanger climax – so that as the projectionist was scrambling to change reels, the audience was in a state of high anticipation about WHAT HAPPENS NEXT – instead of being frustrated and pissed off about having their moviegoing experience interrupted in the middle of a key scene. Because nobody likes having a climax interrupted, right? 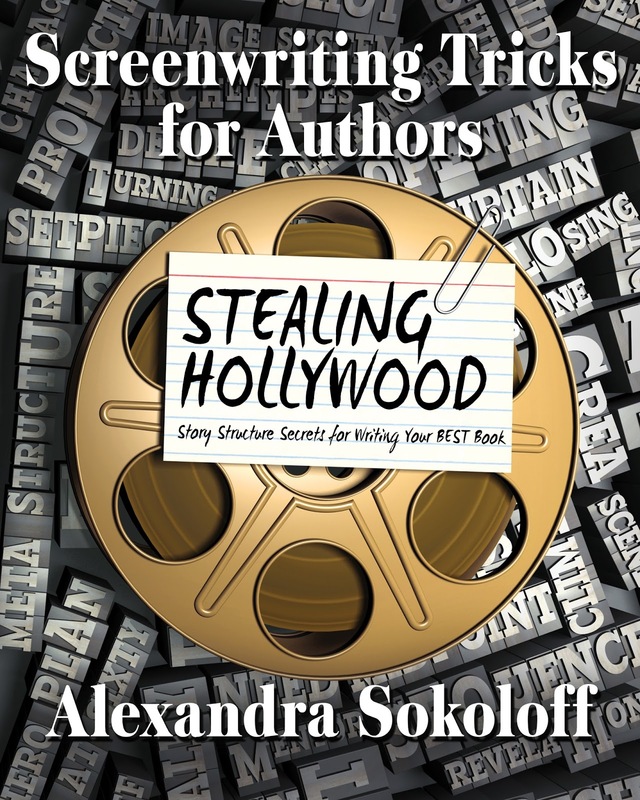 The setpiece is a fabulous lesson to take from filmmaking, one of the most valuable for novelists, and possibly the most crucial for screenwriters, and I talk much more about them throughout the Screenwriting Tricks workbooks. Screening one movie looking for this structure one will get you far, three will lock it in, and as you practice looking out for it, this new awareness will open new worlds in your writing. But eventually, it will be as natural to you as breathing, and you will find yourself incorporating this rhythm into your storytelling without even having to think about it. Alex will be stopping in to answer questions, so bring them on! Your articles and books are always full of energy and excitement. You're an adventurer, too. Loved following the treasures of Bloody Scotland via you and yours! Welcome Alexandra and oooooooh! I love hearing about things like the projectionists changing reels - so cool. Off to find Three-Act Structure! I'm getting pretty good with three acts, so breaking it down further will be interesting. Although I suspect that once I do, my reaction will be along the lines of, "Duh. Why didn't I see that in the first place?" When I was stumped about story structure I turned to screenwriting... because those guys really have it sussed out. I'm going to have to get your book. Hey, Susan - I know, isn't the projectionist thing interesting? It just makes the whole story structure thing so concrete and practical. And that incredibly rigid structure of TV - having to write to the commercial break. OF COURSE we've absorbed that rhythm unconsciously. How could we not? Hallie, it's so true - there's just no room for error in screenwriting. That precise form makes it so much easier to understand the underlying mechanics of story. Plus, we all have a shared vocabulary of movies because we've all seen so many of the same ones. That's not so true about books. I'm fascinated by the setpoint scene and love the idea of watching movies to understand it. I'm also thinking about how artificial events (television commercials and the need for a reel change) have influenced how we tell stories and our expectations about how they will be told. As technology and the way we consume our stories changes (say "Netflix"), I wonder how storytelling may change. So many people binge-watch entire series, how might that make writing the series change? I remember binge-watching the entire first season of True Detective over a weekend and feeling like I was on a never ending roller coaster ride. On to get your book, Alexandra. I'm hooked. Michele, you're right - I don't think there's any doubt that Netflix and Amazon Studios, streaming and binge-watching are changing our expectations as readers. 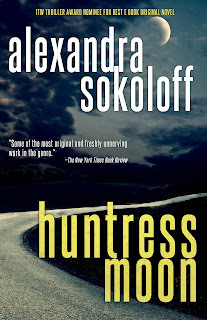 Thomas & Mercer deliberately released the first three books of my Huntress Moon series in a fast rollout - a binge-read! I expect we'll be seeing much more of that model in publishing. Alex, I'm wondering about chapter endings and whether you feel they should all end with a hook, the way TV shows do going to commercial? Because that's the logical point where a person reading could put the book down--to turn out the light or move on to something more interesting or compelling. And by the way, my copy downloaded automatically on release day. It's so fun when that happens! You're so brilliant! Thank you! I think about this all the time (in a less erudite way!) in writing news stories. And it's so clear, you are so right-our brains understand that rhythm. If Law and Order starts at 10, and you turn it on at 10:40, you know they are not going to be in the midst of the investigation. And that some suspect will have been eliminated--maybe!--because there is a big twist about to arrive. Lucy/Roberta - I think it's smart to end chapters with a hook. You definitely don't want to overdo it! It would be painful to end every chapter with a cliffhanger! But ending a chapter with a question you put in the reader's mind is always a good idea. Just having the doorbell ring and then ending the chapter so that you have to turn the page to see who's at the door - that kind of thing creates suspense and anticipation. Take a book you find particularly suspenseful and read it through focusing on how each chapter ends. It's a great exercise! Hey Hank! Hoping to see you at Bouchercon! Then I'll write write write, and go back to the chart when I get stuck. I don't worry too much about where things fall when I'm doing that bash-through draft; I just try to get the story out in some very basic form. And then when I have a first draft I go back to the chart again and re-outline on the chart before I launch into the second draft. If you're a pantser, you don't have to worry about sequence and act climaxes in your first draft at all, but they can come in really handy when you're rewriting. It's just a tool - but it's a REALLY useful one! Alex, some authors do this so well that as a reader, you can almost imagine the movie version of the story! But the best take-away from your advice is that this is yet another 'tool' for our toolbox--it won't let you sit down and automatically bang out a masterpiece--but it's a great tool for working with a WIP. Thanks! 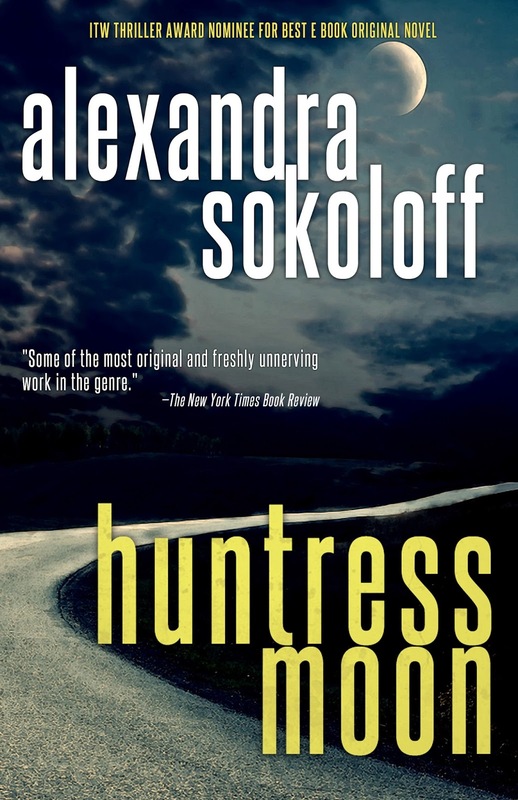 And gotta go look for your Huntress Moon books! Waving to Alex... in Scotland? So fun to see you posting here again. Your screenwriting book was one of my very first Nook book purchases (among the first three), back in 2011. It's an ongoing project for me to try to crack this nut of crafting a story using the three-act structure, and your book is one of the tools in my arsenal of reference works to do so. My project this weekend is a 1000 word short story for NYC Midnight competition. So, shall I try and use this method? You're right, FChurch - Tool, roadmap - it won't write your story for you but it WILL help you outline, write and rewrite better books. Hi Karen! Yes, I'm in Scotland, but headed to Bouchercon soon. I'm so glad the book is being useful for you! Denise Ann, I don't write shorts very often, but my observation is that a short is usually a first act with a twist at the end. Oh ho! yes, I am kind of a pantser, so that's very reassuring. Thank you! Off to see the..chart. I hadn't thought about it before, but, yes, it's human nature to binge if we find something we like/love. If we can work with, instead against, human nature, we'll be better off. Way back when I was first floundering around writing fiction, I couldn't plot my way out of a tissue paper bag. What the screenwriters said made the most sense, finally resonating after decades of exposure to their patterns. I'm looking forward to reading more about Setpieces, especially regarding how much to show. I imagine you can go overboard with them. This is fascinating. Will be doing some "homework" soon! Thanks for sharing your secrets, Alexandra. Thank you for a thought-provoking essay, Alexandra. I've been in theaters where the film broke before the end of a reel. Now I see why that's so annoying. The audience doesn't get the mini-closure of one of those climaxes. I can't even imagine how horrible my writing would be without having taken her class at the West Texas Writers Academy. 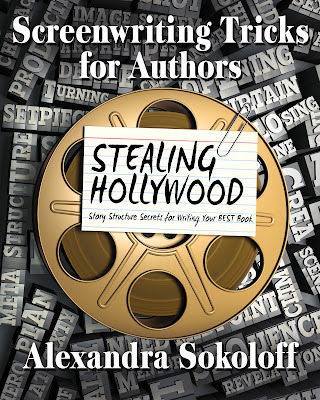 And, now the print copy of Stealing Hollywood. Thank you, Alex. Not just for sharing your knowledge but also for caring about each of us who call ourselves writer's. This is fascinating! Thanks, Alexandra! I've been aware of the three act structure for a long time and find that my book do seem to naturally fall into that pattern, but I hadn't really thought about the eight sequence part. Just bought your book, and now to decide what movie to watch with my timer tonight... Perfect to have this on a Saturday! Alex, I love planned structure in writing, and when I worked with students from elementary to high school in preparing pieces for their writing portfolios (until recently a state mandated requirement for 4th, 7th, and 12th graders), I always told them that if they organized their writing into parts before jumping in blindly that half the battle would already have been won. And, it was way too often a battle to convince a student that he could or should write. As I was truly interested in what they had to say, I sometimes had an advantage in persuading them. I can remember an outline I created for the students to use as a guide in writing their persuasion or opinion papers, and it was in three parts. However, I admit to being ignorant of the three act structure, not being an author. I should have been aware. Thank you, Alex, for making me so now. I'm looking forward to reading some of your writing books, your Huntress Moon series, and applying the three-act model to the next movie I watch. I'll have to include at least one of your books in my packing for Bouchercon. Rhonda, isn't it great when you see you're already doing this? You definitely can have TOO many set pieces; it's good to save those big scenes for your climaxes. You're welcome, Edith! I hope you find it expands your writing in all the right directions. Kathy Reel, as a primary, middle, or secondary school teacher, you can't possibly be aware of all the intricacies of every subject you're expected to teach. You're fighting the good fight and it sounds like you did just great with your kids. But for people who do teach writing to kids, what better way to get them engaged than to start with examples from the movies?